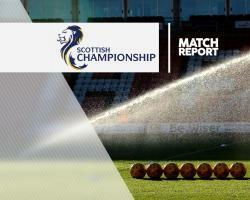 A first-half effort from Kris Commons proved enough as Hibernian extended their lead at the top of the Scottish Championship to six points with a 1-0 at Dumbarton. The visitors dominated early possession and made it pay as on-loan Celtic forward Commons handed them the lead after 14 minutes when he picked up a loose ball in the box from a David Gray cross to fire home. Lewis Vaughan had a good chance to equalise midway through the first half with his shot from the edge of the box heading for the top corner, but Hibs goalkeeper Ross Laidlaw did well to push his effort clear. Both sides pressed hard to get on the scoresheet in the second half with Gregor Buchanan's header the closest the Sons came to equalising as the visitors held on for maximum points.